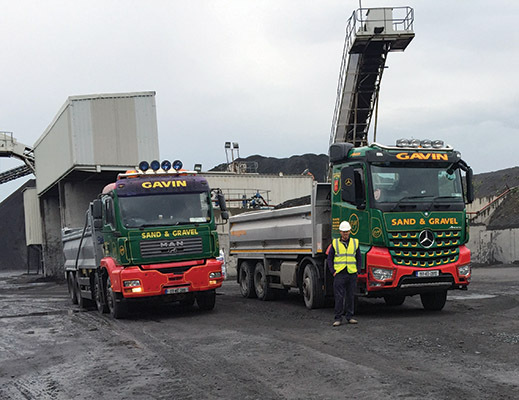 Supplying the best-quality materials to the construction trade in the greater Dublin / Kildare region for over half a century, PJ Gavin Sand & Gravel has underlined its commitment to customer service by investing in a spectacular new Mercedes Arocs tipper truck. We visited the company’s Kill base and met up with director Eric Gavin to find out more. Earlier this year, County Kildare based PJ Gavin Sand & Gravel became the first company in Ireland to take possession of the new Mercedes-Benz Arocs - a heavy-duty construction vehicle that delivers power, robustness and efficiency in equal measure and is totally at home both on the road and on-site. The new truck epitomises PJ Gavin Sand & Gravel’s commitment to providing customers with the best possible service. The Gavin family is synonymous with the sand and gravel business in the greater Dublin area. 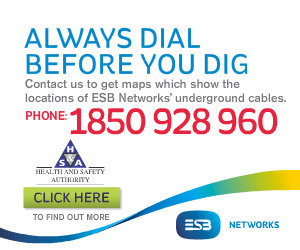 They first began to extract sand and gravel from their quarry in Kill, County Kildare in the 1950s and have grown into one of the premier suppliers of sand, pebble, all grades of crushed stone, Clause 804, Clause 808 and SR21 Annex E to developers, utility companies and road contractors etc. in the Kildare / Dublin / Wicklow region, offering a personal touch and competitive prices. PJ Gavin Sand & Gravel is also licensed for site clearance, being fully certified and authorised for the disposal of rubble, soil and subsoil. Quality – in terms of both the products supplied and the service provided – is a requisite. “We hold all the relevant Declaration of Performance certificates and we strive to provide the best-possible service at all times, running a modern fleet of reliable trucks,” confirms Eric, who has been part of the family business for 14 years and counting. At present, the company provides gainful employment to five people. The economic downturn presented some very difficult challenges but PJ Gavin Sand & Gravel has come through the worst of it and is now in a stronger position going forward. “We had a few tough years and at one point I had to scale it back to just myself, but I’ve slowly built it back up and we’re doing well at the moment. We’re not going to get overly ambitious. We’re happy with the size we’re at now. It’s probably best to stay small so you can keep your thumb on it. “It’s still up and down but, in fairness, we are after having eight or nine very good months. That’s the nature of construction – it’s always up and down and you just have to grind it out and something always turns up. Things are definitely on the up again and we have a good, well-maintained, modern fleet to facilitate the workload. “We have the capacity to supply any projects, large or small. When we’re working on a bigger contract, we can enlist other hauliers to help out, which is handy for all parties. “Dublin is where all the work is these days, to be honest. That’s where the vast majority of construction is taking place. We do a little bit in Kildare, Wicklow and Meath but nearly all of the activity is in Dublin,” Eric concludes.